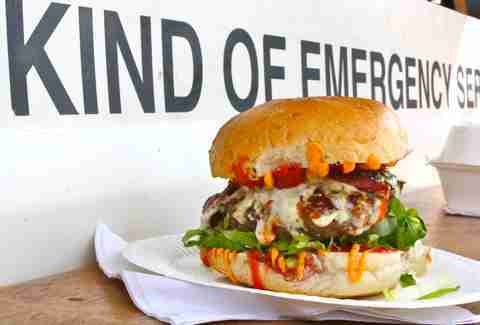 London’s burger scene is booming, with everyone using inventive new styles and ingredients (even Tesco’s Values range! Zing!) -- but have you noticed that pretty much every "best of" list features the same dozen or so buns? We’re talking Patty & Bun, MEATliquor, Honest Burgers, Hawksmoor... and sure, they’re amazing, but that also leaves a ton of also-amazing places that rarely get to see the meaty spotlight. 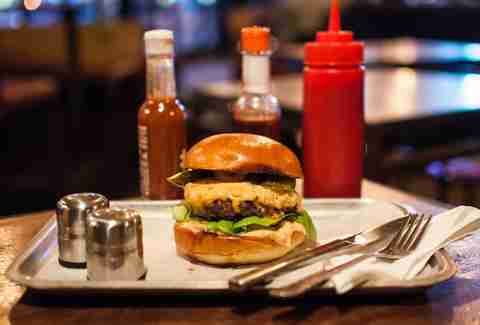 We’re here to redress the balance, and present to you London’s finest under-the-radar burgers. You won't find any of these on 1) Time Out, 2) The Evening Standard, 3) ShortList, 4) our own. 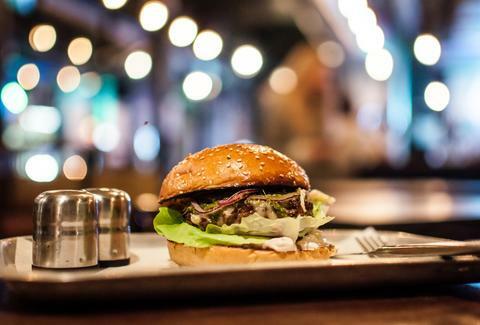 This classic French bistro tucked away by Spitalfields Market does a duck burger topped in a slab of foie gras. 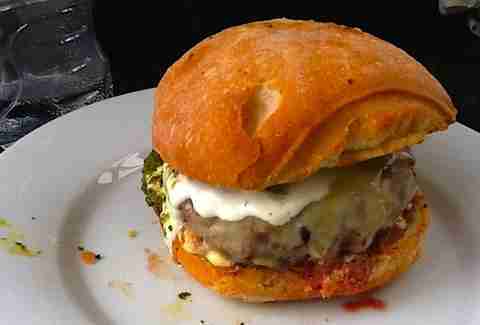 The patty itself is a 50/50 split of confit and raw duck, and it is delicious. 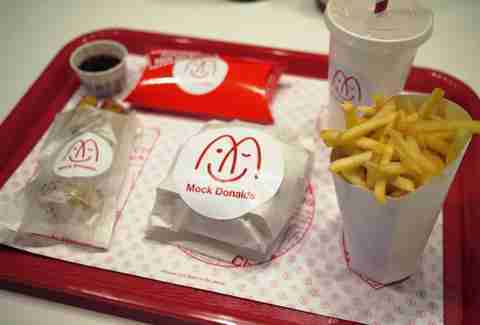 If you’re really a duck liver geek, they have have a mini “signature” burger, which is just foie and truffle mayo. Bad for the heart, awesome for the soul. 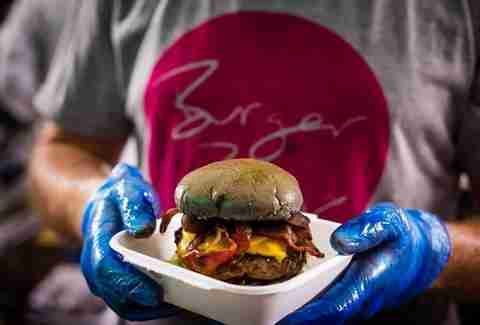 Bonded together from mornings of blasting music while prepping as chefs in proper restaurants, OFM started with a twist in the -- you guessed it -- fry-up game and have expanded to mammoth burgers, which frankly, is their calling. The texture on this beast of a burger is what really gets people going -- buttery soft bun, slightly caramelized edges on a juicy patty, thick, almost crispy bacon, and soft blue cheese sauce. What started as a tiny spot in Shoreditch’s BoxPark, they now have a second site, more permanent in Brixton. 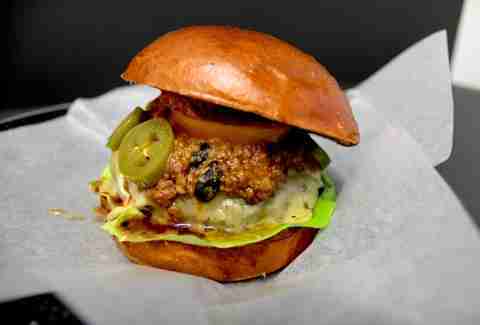 While their constant menu is solid, it's the creative monthly specials that are what we are here for; in April it's Walker’s Chilli Burger, which has a beef patty, topped with chili con carne, Monterey jack, Lone Ranger Dressing, and honey & bourbon pickled jalapeños. Their Grizzly Bear Burger is summed up with a very important substance: bacon. Not content to just have double oak-smoked bacon, they only went and made bacon jam to throw on top. They currently have a residency at The Old Nun's Head, but are gunning for a brick-and-mortar of their own in the near future. Fred Smith is basically the Willy Wonka of the London burger world; while warming up his burgerific skills at The Admiral Codrington, he gained the attention of the guys over at Byron, who roped him in as Head of Food Development, which basically means he gets to invent crazy ideas for burgers all day. Besides doing Byron’s monthly Burger Club, he also occasionally does pop-ups where he brings his rather spectacular creations, like the Béarnaise Burger, with shallots and béarnaise (duh), and the patty is deep-fried in beef fat. Just think about that for a sec. Exactly. This is one of those beasts that requires two hands, a roll of napkins, and the eating etiquette of a Viking toddler. The patty is a chuck & fore rib mix, kept a beautiful pink medium rare every time (unless you wanted it cooked more, but why would you?). Layered on that they’ve got Monterey Jack, a crunchy golden onion ring, plus the usual suspects tomato/lettuce/pickle, but the real kicker here is their secret, delicious, Psychic Sauce. Chef Chris Golding went for a colorful twist on this one. The aged-beef patty is great, but that's not what we’re talking about -- why settle for normal bacon and cheese when you can have pancetta salamata and absurdly gooey stracciatella? 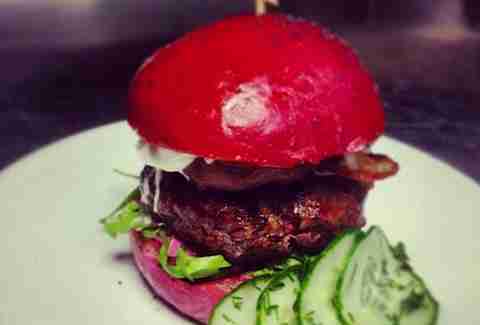 But it doesn't stop there: it's all loaded between a poppy seed beetroot bun with a little beetroot mayo, too. 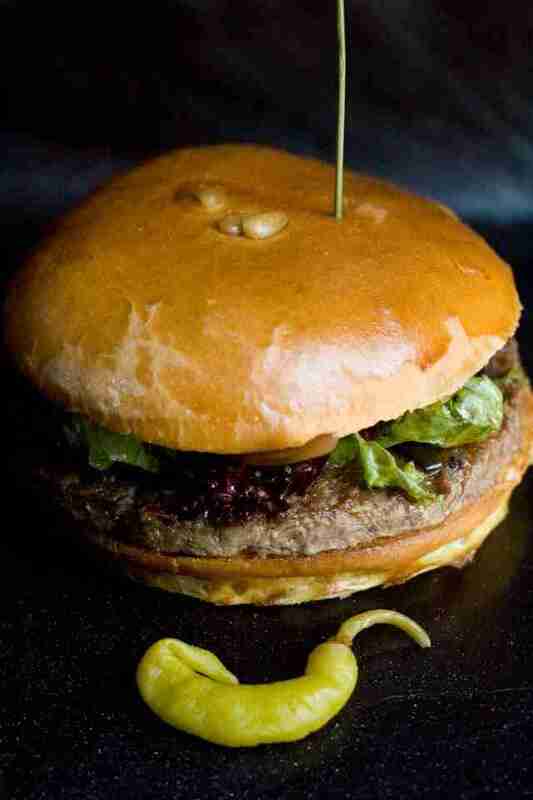 Check this: their patties -- called Heartbreakers -- are 50% ox heart. That deep, meaty flavor will sooth your soul even before they layer on spicy 'nduja (Italian sausage paste basically), smoked Provola cheese, Kewpie mayo, and pickled onion.